The ZMR150 frame is provided by Airblade UAV. 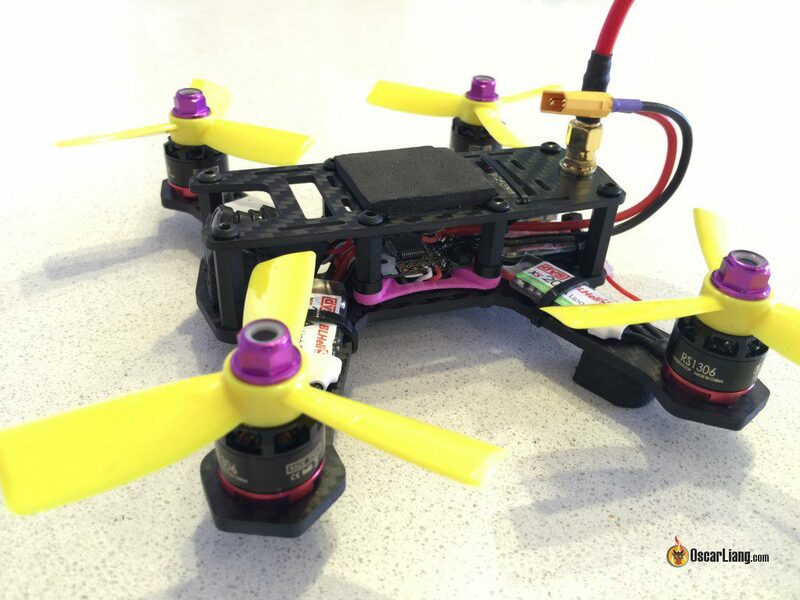 This is a no frills mini quad frame that comes with a unibody 3mm bottom plate and a 2mm top plate, a packet of nylon standoffs, spacers and a lipo strap. The frame is well made and the carbon fibre looks to be of a high quality. A dry assembly of the frame proved to be very quick and easy, and the lower profile standoff really make this quad look slick. 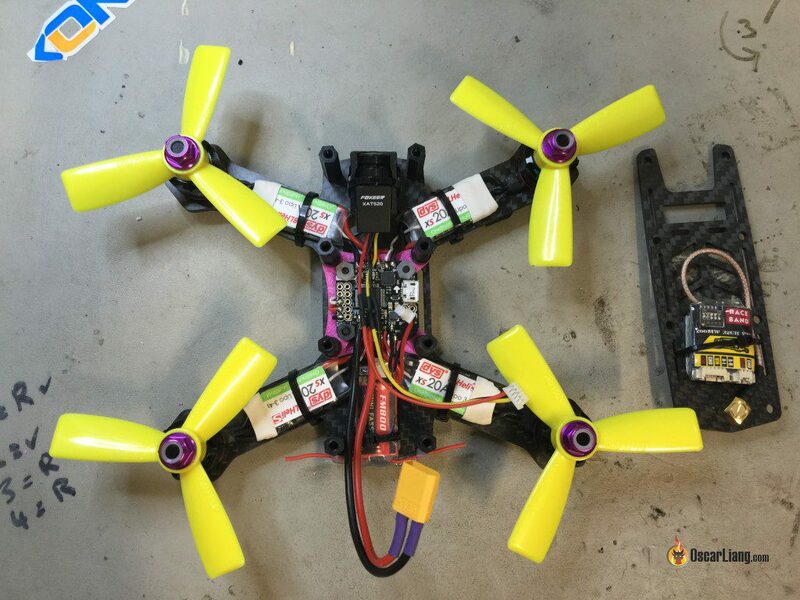 I chose to use Emax Red Bottom RS1306 3300kV motors and DYS XS20A BLHeli-S ESC’s, and while the 20A are overkill for this size frame they draw no more than 10amp, so why not. 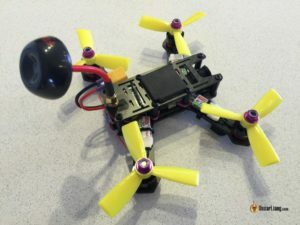 The flight controller of choice is the FuriousFPV PIKO BLX with a 3D printed adaptor plate, which is a perfect FC/PDB combo for a build of this size. Worth mentioning here that the frame will take a full size FC as well, e.g. 36mm x 36mm. Like all 150 sized frames your choice of components is very important as you do not have a whole lot of room, but this is not a fault, but rather a god send as it forces you to keep weight down. With the FC, motors and ESC’s on, I chose a FM800 micro RX (For Futaba Radios only, 14SG etc.) This RX fit comfortably inside the frame at the rear, with the antenna to be hotglued across the end of the frame. I am sure D4R-II or X4R-SB would fit nicely too if you are using Frsky transmitters. The FPV camera is a Foxeer XAT520 CMOS camera and it’s a brilliant (if not the best) CMOS camera on the market. Camera is held in place with cable ties and sits in a 25-30 degree Pico camera mount (3D printed) found on Thingiverse, a little trimming and the Foxeer cam slides straight in. The underside of the top plate houses the Hawkeye VTX with enough room to use the VTX hole in the top plate at the rear. I opted for mounting the lipo on top and found it best to use a lipo strap that goes around the bottom plate and top plate, to help keep the whole thing frame together nice and snug. The top plate easily fits a 700mAh Turnigy 3S lipo or a 450mAh 4S lipo. So, will suit those that wish to slide under the 250 gram weight limit in the USA. None really, but will say that depending on what FC/PDB you go with , you may have to play around with the nylon standoffs over the fc to ensure they marry up inline with the front and rear ones to allow a smooth finish to the top plate when screwed down. My Complete parts list for this build. Due to bad weather I have only been able to do a short test flight. Just as a courtesy to builders, more so new builders. This is not a straight forward easy build as it requires almost surgeon like soldering skills as the PIKO BLX board is tiny, the use of a LED powered Magnifying light is Highly recommended. For seasoned builders it will be no problem at all. Overall, I am very impressed with the quality of this frame, is feels strong, looks fantastic. This is one frame I would easily recommend to others. Just want to put in a little correction, the bottom plate is 3mm and top plate is 2mm. thanks Airblade, that’s corrected now.